Here's a new addition to the blog, courtesy of the Old Time Radio Researcher's Group. 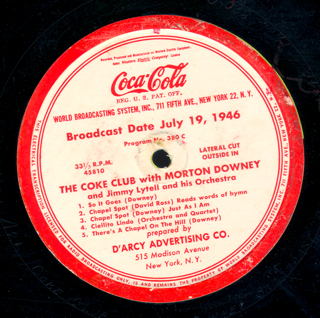 "The Coke Club" was a quarter hour of song featuring Morton Downey that was syndicated by the Coca Cola Company in the 1940s and produced by the D'Arcey Advertising Agency. The show, heard Monday through Friday, was aimed at women in the household and featured light music and sometimes an interesting story of a "Big Little American" who had made contributions in their local community. The program of July 19, 1946 starts out with Downey singing "So It Goes". Since this is a Friday show, there's a religious segment with a hymn and a reading by announcer David Ross. The show also features Jimmy Lytell and his Orchestra. Downey was nicknamed "The Irish Nightingale" and, if Amazon.com were around in the 1940s, it would likely say that "People who bought Morton Downey also bought Dennis Day". Downey had a long career in records and radio and is the father of television personality Morton Downey, Jr.
Digital Deli has a nice page about Coke's various sponsorships in radio over the years including "Singin' Sam" and many other series. I'd like to thank OTRR for this disc and a few others from the series that they donated to my collection. I'll drop in episodes of "Coke Club" on occasion. The program was transferred from an original World Broadcasting vinyl transcription, matrix number bb45810. Sorry for the rough sound - I had to use some serious click reduction on this one. Other shows I have in the series are in a bit better shape.